Appearing Friday before the House Energy and Commerce Committee's Subcommittee on Oversight and Investigations, the CEO and CFO of Solyndra both invoked their fifth amendment right against self-incrimination. But instead of highlighting the cover-up in the scandal of the $535 million federal loan trumpeted by the Obama administration to the solar panel manufacturer which went bankrupt, neither ABC nor NBC mentioned the development Friday night and CBS allocated a mere 25 seconds. 'Images of its executives taking the Fifth today are not the optics the White House had hoped for,' NBC's Lisa Myers noted on Friday's Today show, a concern the White House didn't have to fear from NBC since its evening newscast didn't bother to show any such images. 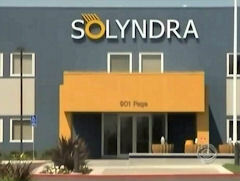 Neither ABC's GMA nor CBS's Early Show offered a word about Solyndra on Friday morning. ABC's World News, however, found time to fact check what Republican presidential candidate Rick Perry said during Thursday night's debate and how no candidate condemned audience members who booed a soldier in Iraq posing a question via YouTube. NBC Nightly News viewers saw a laudatory full story on President Barack Obama's decision to allow schools to op-out of 'No Child Left Behind.' And Brian Williams devoted as much time – 25 seconds – to the illegible signature of OMB Director Jacob Lew as Pelley used for his Solyndra item. In Washington today, the executives who got more than $500 million in government loan guarantees to expand their solar energy company didn't have anything to say about how it went bankrupt. They took the fifth before a congressional committee investigating Solyndra and those loan guarantees that have left taxpayers on the hook. The FBI is looking for answers, too. It seized files from Solyndra's California headquarters. - Brent Baker is Vice President for Research and Publications at the Media Research Center. Click here to follow Brent Baker on Twitter.